Rockfalls are frequent instability processes in road cuts, open pit mines and quarries, steep slopes and cliffs. The orientation and persistence of joints within the rock mass define the size of the kinematically unstable rock volumes and determine the way how the detached mass be-comes fragmented upon the impact on the ground surface. Knowledge of the size and trajectory of the blocks resulting from fragmentation is critical for calculating the impact probability and intensity, the vulnerability the exposed elements and the performance of protection structures. 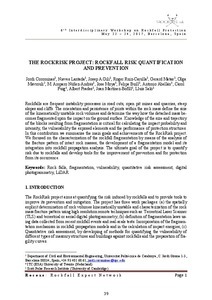 In this contribution we summarize the main goals and achievements of the RockRisk project. We focused on the characterization of the rockfall fragmentation by means of the analysis of the fracture pattern of intact rock masses, the development of a fragmentation model and its integration into rockfall propagation analysis. The ultimate goal of the project is to quantify risk due to rockfalls and develop tools for the improvement of prevention and for protection from its occurrence. Corominas, J., Lantada, N., Gili, J., Ruiz, R., Matas, G., Mavrouli, O., Núñez-Andrés, M.A., Moya, J., Buill, F., Abellán, A., Puig-Polo, C., Prades, A., Martinez-Bofill, J., Salo, L. The RockRisk project: rockfall risk quantification and prevention. A: Interdisciplinary Workshop on Rockfall Protection. "6th Interdisciplinary Workshop on Rockfall Protection: RocExs 2017: Barcelona, Spain, 22-24 May, 2017". Barcelona: Centre Internacional de Mètodes Numèrics en Enginyeria (CIMNE), 2017, p. 39-42.